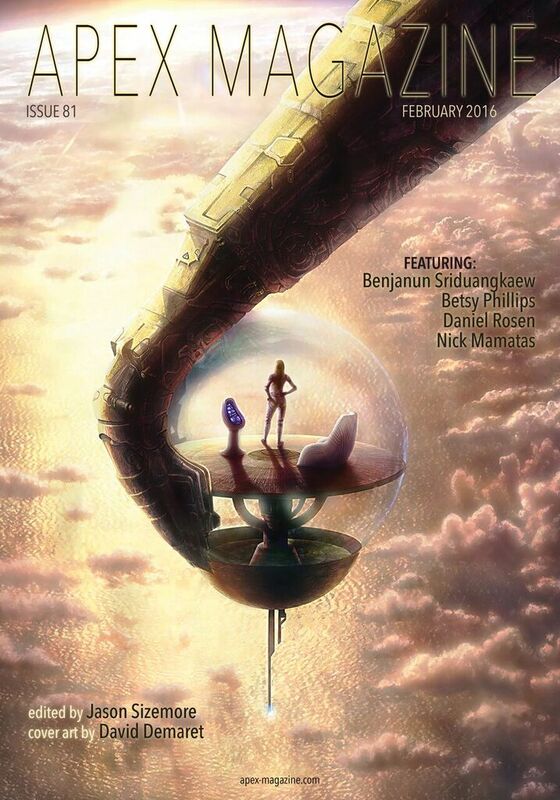 Apex Magazine #81 features original fiction by Benjanun Sriduangkaew, Daniel Rosen, and Betsy Phillips. Heather Morris, Mike Jewett, Crystal Lynn Hilbert, and Laurel Dixon have contributed four poems. Andrea Johnson interviewed Benjanun Sriduangkaew about her story and writing. Russell Dickerson talked with cover artist David Demaret about his work. Over the course of the month all of the issue’s content will be made available free online. The immediately available material is linked below and, for the rest, the release schedule is shown. The full issue can be purchased now for $2.99, in PDF, ePub, or mobi formats direct from Apex of through one of their online retailers. Subscriptions are also available. I see our field’s long tradition of sheltering and publishing abusers is continuing. If Sriduangkaew can continue to publish in prominent genre magazines despite being the most notorious cyberbully in the field–to the point of instigating at least one suicide attempt–then I suppose we’re not really as far along the whole ‘get abusers out of the field’ path as I’d hoped. Any magazine that publishes Requires Hate will never get a cent of my money. Dangit. I just caught myself Puppying. I don’t support bullies. I’ll be skipping this issue. Yeah, I’ll be skipping this issue. Did Winterfox at least branch out from her genocide fantasies and sociopathic protagonists? Not the last I read. Plenty of other places to give my custom to, anyhow. Well, that’s a depressing thing to see. She was in Clarkesworld last month as well. She does occasionally write what I consider a good story, but I haven’t cared for either of her stories so far this year. I can’t see boycotting a magazine just because I didn’t like the real-world behavior of an author they occasionally published though. I’m not boycotting the magazine. I just see no reason to give it any priority amongst the myriad of things I have to read and do. That’s fair. Lightspeed and Interzone are strong this month. Why is her name first?? I am inundated with things to read (not just SF). So when I have even a whiff of a reason to pass on something, I do. This magazine and its stories get a pass unless someone raves about one of the other stories. Why is her name first? The curve of the bubble in the art. Her name’s the longest, and it’s in the position with the most horizontal space. I would have wanted to put Nick’s name second, to continue the curve better, but since his story’s a reprint they may not have wanted to do that. Well, I have the issue because I subscribed, but my policy is to skip her stories. Skip it. I read it out of curiosity, and wished I hadn’t. Yet another turgid effort written in self-consciously purple prose about how cool genocide is. Add in a protag who’s a rich woman in a me-me-me flounce because the world is so mean. Self-insertion much? I’d been thinking of subscribing to to the magazine, as several really good stories have showed up there over the past few months, but if she’s going to be showing up in it, I think I’m better off continuing to buy the occasional issue. Add me to the list of people who aren’t buying this issue, nor any other in which she appears, and is side-eyeing the whole magazine. I have plenty of other places to spend my time and money.